Sure, ‘forever’ is a bit misleading. We are talking about cut flowers after all, whose brief lives are part of their irresistible charm. Like their namesake, however, Heliconias can claim beauty and vase life that few other blooms can match. In Greek legend, Mount Helicon was the home of the Muses, nine divinities that embodied the Greek love for Art and Science and who were said to remain forever lovely and youthful. One could say they lent these qualities to the Heliconia, which is harvested at the peak of its beauty and enjoys a vase life upwards of three weeks. That’s practically FOREVER! Heliconia, also known as Lobster Claw, Toucan Beak, Wild Plantain and False Bird-of-Paradise (for obvious reasons) is native not to any Hellenic mountains, but to the tropical climes of Central and South America. Over the generations it has been successfully transplanted to parts of Africa, Asia and the Pacific. Spanning nearly 200 species, Heliconias come in shades of red, yellow, orange, and green. Their pollinators are almost exclusively hummingbirds, who have evolved with a variety of bill shapes to accommodate the various Heliconia species. Aside from Heliconia’s vibrant, exotic tropical beauty, another of its calling cards is its long vase life. A large, well developed (and well-cared for) stem can last up to 21 days. It is a beauty that can be enjoyed from the first moments, as it is harvested at the peak of its development. Of course, that vase life will also depend on proper care. 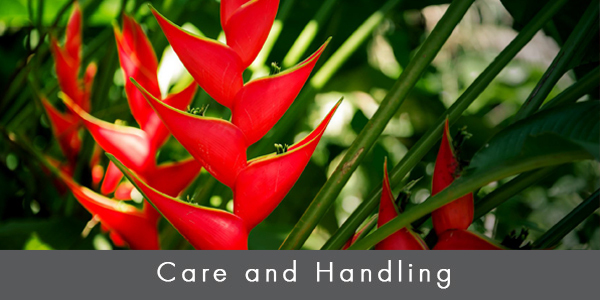 So FLORALIFE® presents some handy Heliconia care and handling tips for wholesalers, retailers and flower enthusiasts! Know the flower’s origination and cultivar. 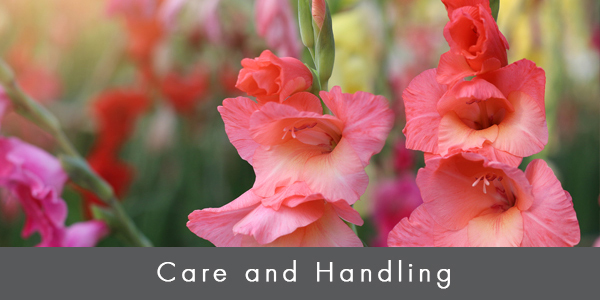 Determine if blooms have been stored wet or dry. Avoid stems with leaf yellowing. Choose stems with large, fully-formed bracts. They will NOT develop or open further postharvest. Start processing with a clean bucket, sanitized with D.C.D.® cleaner. Fill buckets with cool water mixed with flower food solution according to manufacturer’s recommendation. Do not put flowers in metal/galvanized buckets. Use clean, high quality water that has not been treated with a water softener as the salt levels can be damaging to flowers. Remove foliage below solution level. Cut approximately 1” off stems. Use clean, sanitized clippers or knife. Place flowers in prepared container. Allow minimum 2 hours to hydrate placing buckets in an area with good airflow. 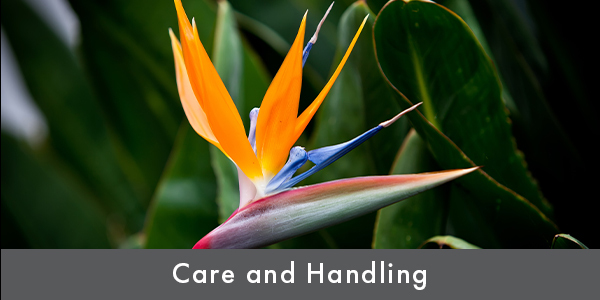 Always remember FIFO (first in/first out) when rotating Heliconias or any other flowers. Place Heliconias in a 55-60˚ F cooler with 75-85% humidity. Heliconias are cold sensitive and will develop black spots on the flowers (bracts) at temperatures below 50˚F. Split leaves (damage during shipping). Brown, shriveled bract tips (dryness during shipping). Darkened or slimy stems (waterlogging). Black spots on bracts (cold damage). When Heliconias die early, it is most often a function of poor water uptake. Pay special attention to the health of the stems, cutting as necessary and replacing flower food solution. Birds of Paradise: Beauty and Drama take Flight!